Clearwater Historical Society, founded in 1978 in Clearwater, Florida, is a non-profit organization intent on documenting and promoting the rich history of our beautiful city and the Greater Clearwater area. Society collects and preserves artifacts, provides our knowledge to educational facilities and the public, and designates chronicles and preserves historic sites. Our most recent project is the restoration of the South Ward School campus. 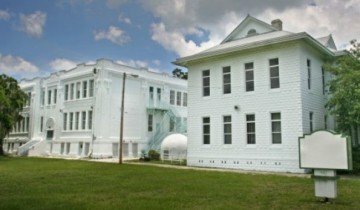 Society began leasing the property and the buildings of the former South Ward School in 2014 from the Pinellas County School Board to restore and house the Clearwater Historical Society Museum and Cultural Center. These beautiful buildings are a listed on the National Register of Places and located in beautiful downtown Clearwater. The campus is comprised of 7 buildings having been built from 1906 to 1971. first phase of the project will be to open the original school building facing West on South Fort Harrison Avenue. Built in 1906, this building will house the main museum. old Media Center / Library will play host to local group meetings and performances with our partners in two local theater groups. grand scale of this project will require resources in the form of volunteers and funds. This where you come in. The Society desperately needs a climate controlled storage facility for all of the artifacts, pictures, and maps that have been collected and donated. These items are located in various storage areas throughout the city and need to be relocated to one area for cataloging and exhibits. Our intent is to convert the building that was the old PE office into a state of the art storage facility. This building needs to be upgraded with storage shelving and air conditioning. No, it doesn’t sound exciting but this upgrade is critical for the overall project. As we are located in the Sunshine State, the humidity and heat wreaks havoc on the items we have acquired. Most critically, the Society was bequeathed the entire collection of negatives and pictures from the Fulmer estate. Mr. Fulmer was the city photographer for decades and the collection is a treasure trove of Clearwater history. Storing these precious memories is one of our biggest priorities to both honor Mr. Fulmer and preserve our past. Please consider making a donation to help move our progress along. Every little bit helps and all donations are tax deductible. Thank you for helping us put Clearwater's rich history on display for today to share with future generations! We have finished painting Building 1 - matching the orginal colors of the natural stone. One step closer to opening the Clearwater Historical Society Museum and Cultural Center. Please consider helping us with preserve South Ward so that we can tell the story of Clearwater and its history.